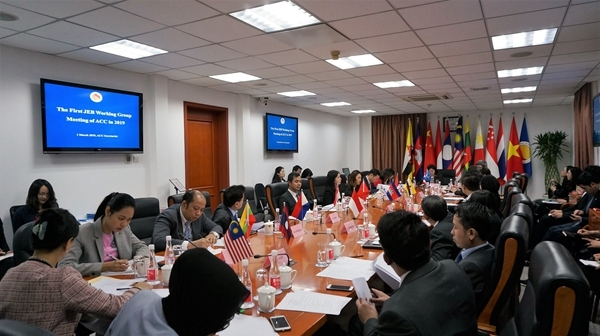 On 1 March 2019, the Joint Executive Board (JEB) Working Group Meeting of ASEAN-China Centre (ACC) was held at the ACC Secretariat. 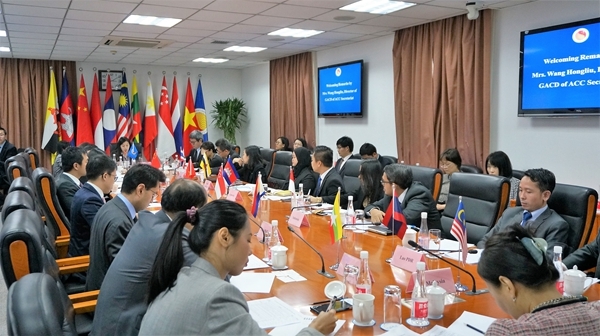 Representatives from Department of Asian Affairs of Foreign Affairs Ministry of China and embassies of ASEAN Member States in Beijng attended the meeting. 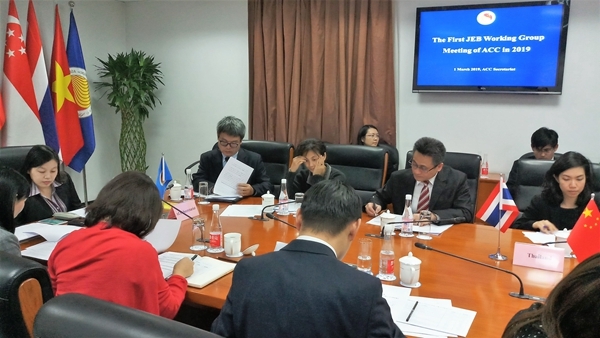 The meeting was chaired by Ms. Wang Hongliu, Director of General Affairs and Coordination Division of ACC. Heads of all divisions of ACC were present. This was the first session of JEB Working Group Meeting held in 2019. Ms. Wang Hongliu thanked JEB members for their strong support to ACC Secretariat. She noted that the year 2019 is ASEAN-China Year of Media Exchanges. Seizing the new opportunities of ASEAN-China relations, ACC will maintain close contacts with all members of JEB, and widely listen to suggestions and comments of all parties. By doing so, ACC is committed to well implementing 23 flagship projects approved at the 8th ACC Joint Council Meeting, and making greater contributions to ASEAN-China practical cooperation. Mr. Mongkol Visitstump, DCM of Thai Embassy in China, briefed the meeting on the work priorities of Thailand as the rotating chair of ASEAN in 2019. He said that the theme of ASEAN this year is “Advancing Partnership for Sustainability”, which is in conjunction with ASEAN-China Year of Media Exchanges. He believed that new progress would be made in the ASEAN-China mutually beneficial cooperation. Mr. Cheng Hongbo, Deputy Director of Regional Cooperation Division of Department of Asian Affairs of Foreign Affairs Ministry of China, briefed on China’s relevant work priorities of this year. He emphasized that China looks forward to enhancing communication with ASEAN, and will follow the guidance of ASEAN-China Strategic Partnership Vision 2030 to carry out a series of activities focusing on the ASEAN-China Year of Media Exchanges, with a view to achieving bigger progress in bilateral relations. Heads of ACC divisions reviewed the progress of each division since the 8th Joint Council Meeting held in November 2018 and outlined the work plan for the next stage. Representatives of JEB members commended the tremendous efforts made by ACC Secretariat, and put forward ideas and suggestions on the implementation of relevant cooperation projects in 2019. They pledged full support to and close collaboration with ACC Secretariat as always. By doing so, they wished to achieve even more fruitful achievements of ASEAN-China exchanges and cooperation in various fields.